One of the ways we use to make our display “magical” is to use the computer to control it. The system we use allows us to split the display up into hundreds of individual circuits, which can be precisely controlled, dimmed, and to use special effects like twinkle and shimmer. It also allows us to synchronize the display to the music we broadcast over our FM frequency. 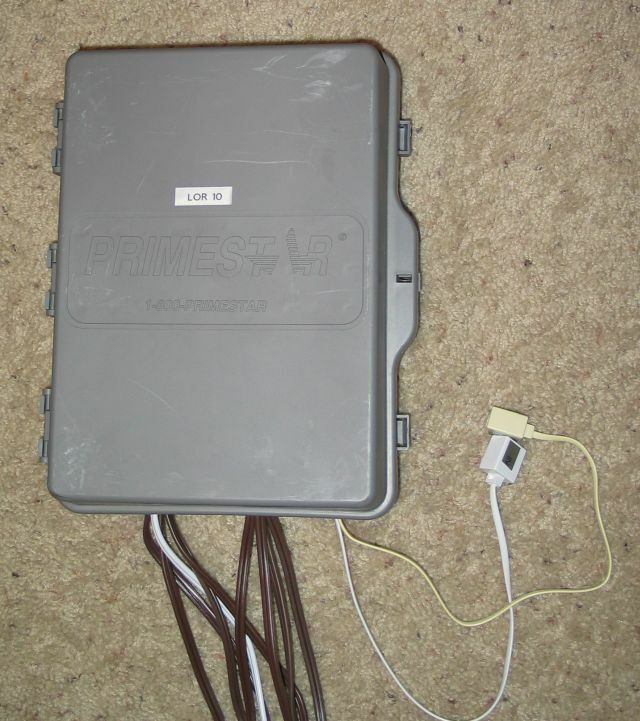 We utilize the Light-O-Rama lighting control products, which we first saw demonstrated at the PLUS Christmas lighting conference we attended in Nashville in 2003. We were literally one of their first customers, ordering just minutes after their online store opened. At that time nobody knew that Light-O-Rama would become the world leader in animated holiday display products– we chose it because it was easy to use, and much more cost-effective compared with other alternatives available at the time. Being modular which allowed us to buy only the channels we need and can budget, and expand later. The Light-O-Rama system also allows us to incorporate DMX devices, which are industry-standard devices compatible with theatrical and concert lighting systems. The computer which controls the light show is located inside our home office. 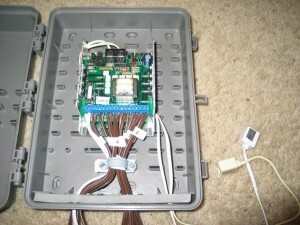 We run cables outside which supply data to special light control boxes located near the displays. 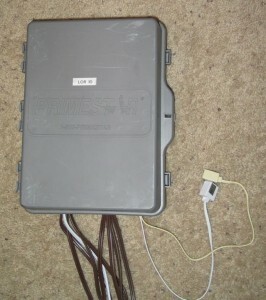 The boxes are linked together to provide a “lighting control network” of sorts. For most of our controllers, we chose to buy only the circuit boards from Light-O-Rama, taking care of the enclosures and wiring ourselves. This saved money, and also helps us customize the boxes for our needs. Light-O-Rama also sells the control boxes completely assembled, and we have units of that type as well. Most of our control boxes look something like the picture at the left. This particular box shown here is an 8-channel controller, and is one of the older boxes in our display from the 2004 season, still going strong after years of work. 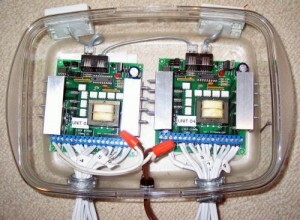 Each enclosure holds either an eight-channel or 16-channel controller board. Here is the box with the cover open. 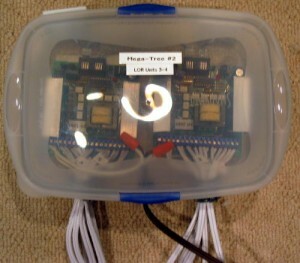 This particular box controls 8 individual lighting circuits. 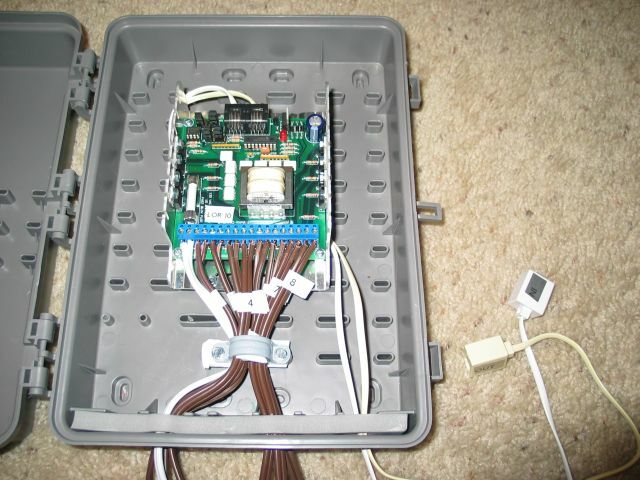 Some of our controllers control 16 circuits which means a larger circuit board and twice as many wires coming out. Our original boxes, which we built for the 2003 season, looked quite a bit different. They actually used a food-type container, similar to Tupperware but a much harder plastic. They looked a little ‘goofy’ compared to the boxes above, but they actually worked very well. We used this style of enclosure up through the 2011 season, but they were finally retired in 2012, with the creation of our pixel Mega-Tree. In 2003 we built two control boxes especially for the original Mega Tree display, each containing two 8-channel boards for a total of 16 channels per module. These “tupperware” boxes have been retired. Here’s a picture of the same box with the cover off. 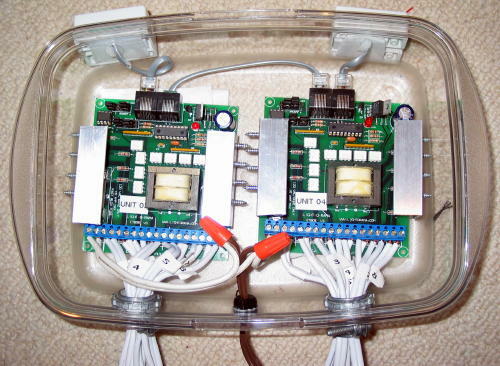 At the time we built these, LOR didn’t have a single-board 16-channel solution, which has long since become their ‘standard’ controller configuration. Here is a screenshot from an early version of the software which we use to control the display — the LightORama sequence editor. Each row is a different computer-controlled display channel, and each column represents a timed event. Events can include lights on, lights off, fade up, fade down, set intensity (dimming level), twinkle, and shimmer. The current version of the software is quite a bit more feature-rich.